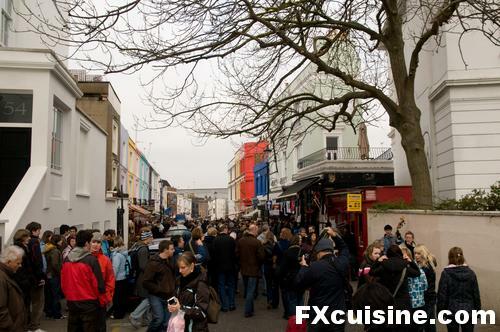 Much like owners of soggy gardens dig holes or trenches to drain off any excess rain, the fine people of Notting Hill, in order to keep their streets quiet and clean, created a tourist drain located on Portobello Road. The system works cleverly, with endless rows of stalls peddling the sort of items that can be found in garbages near you, all generously labelled «antiques». In the spirit of fair reciprocity that has made our free market the sucess it is today, a commission is paid to coach drivers, cicerone and guidebook publishers so they may keep directing tourists. Journalists who market this is «The largest antique market in the world» get a free chinese-made 5-pound plastic brooch. A mobile Cardiac Arrest Response Unit deals with French tourists who thought this was a British answer to Paris' Puces de St-Ouen. All very clever, I admit. The drain is selective and only keeps illiterate tourists off the rest of Notting Hill, to the great enjoyment of residents and the handful of discerning outside visitors who can freely stroll about, blissfully oblivious of the rambuctious crowds just blocks away. Friendly signs, here and there, are enough to remind litterate tourists that the residents take their streets' orderliness to heart. A few more streets, and there we are. I reach Books for Cooks, one of my 20 favorite bookshops in the world. The store opens on Saturday around 10 AM, often with a queue of people waiting to enjoy a muffin or pie with the morning coffee. Today is no exception and, 5 minutes after opening, it is already crammed with foodies. The boss here is Eric Treuillé [hayrick trugh-yay], a Frenchman living in London. Besides running Books for Cooks, cooking for the patrons and giving cookery classes, Eric is the author of dozens of cookbooks. This is how I originally learned about the store - seeing the blurb behind his book «Barbecue». Eric met his wife Rosie in this very bookshop, which they finally bought! Books For Cooks is famous abroad too. I once visited Kochlust, a cookbookstore in Berlin that offers cooking lessons in the back, and told the ladies that run it that their store reminded me of Books for Cooks in London. They were so pleased that tears came to their eyes. This is a very big compliment, they said in unison. And indeed, Books for Cooks is a really pleasant place. Not only can you find thousands of cookbooks, but you can just sit down and eat a slice of pie or a kipper's soup, it's a very popular fish in England said Eric in French, slightly apologetic, not for the great soup but rather for the reaction this might elicit from a Frenchman. I leave my kipper's soup for a minute to look for books. Facing a bookcase titled Europe, I asked Which way to Switzerland? A lady ran up, looked at me, then said I think it's back the way you came. I looked at her blankly, then she added: Let me show you, it should be between France and Italy. We move back, next to my bowl of kipper's soup, and she start roaming through the shelves. I'm sorry, she finally replies with a smile, but we don't seem to have any books about Swiss cuisine in print. You'll have to write it yourself. I used to work very close to Portobello Rd so have spent many happy hours in Books for Cooks. Good to see it again! FX's answer→ Yes, this is a timeless place I think! This was one of my all time favourite places when I was working and training in London, my very first restaurant was just around the corner and I used to go there in my break and spend hours there.In those days the place was run by Clarissa Dickson Wright, of Two Fat Ladies fame and Her knowledge was amazing, you could go in there with the vaguest of desriptions and she knew exactly what it was you wanted. Great shop. FX's answer→ I would have loved to visit the shop when Clarissa Dickson Wright was on deck, that would have made quite an impression! 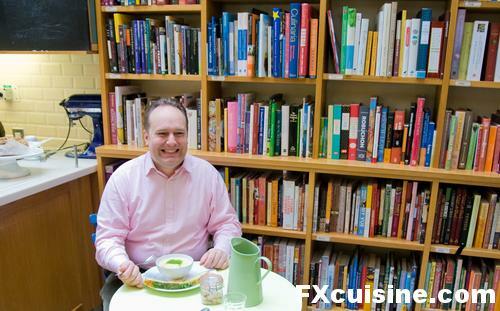 "FX CUISINE: COLLECTED READINGS" It seems you have already written your own cookbook from a Swiss perspective. I am curious as to how many pages one could fill if one were to distill this website into print. FX's answer→ Perhaps one picture per article, each article on two pages? Would there need to be a thematic unity (i.e. the life and times of a wandering deep-fried enthusiast)? I am shocked the store didn't have any swiss cook books! FX's answer→ Yes I know, I have those books and then some, there are tons out there. But it would have been silly, a Swiss man visiting a London bookstore and complaining of the lack of books about Swiss cuisine! So I just laughed and bought books about cheese instead. I enjoyed your visit to the book store. I shall have to see if I may find a recipe for kipper soup. We too enjoy kippers, being of British descent. Well, at least three of us are, the rest are at least 1/2 Polish. It's maple sugaring season in Upstate NY. It's a lovely diversion from our every other day goat cheese making (cheddar and colby, not chevre), and supplements our home grown diet. It's day 2 of my blog, but I think you'll enjoy our attempts at self-sufficiency, foodie-style. FX's answer→ Homemade maple syrup sounds like a great project! FX's answer→ Do you often visit this store? I buy most of my spices online, what special spices does Spice Shop carry? What a great post - thanks very much, I absolutely love it when someone points out somewhere in my home town to visit, that has previously slipped under my radar. I will plan in a trip! 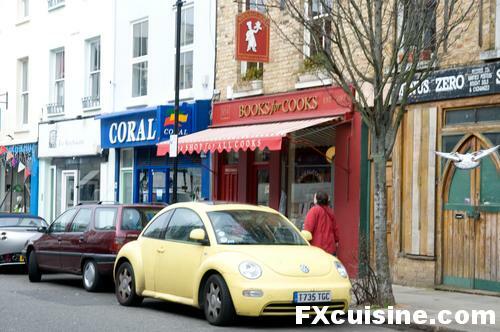 FX's answer→ Visit as soon as possible, just don't fall in the Portobello gutter! Have fun. I'd love to visit that place! Thanks for the article! FX's answer→ By all means do visit! I would love to visit this bookstore, it is like a dream vacation to me. I would be forced to spend entire days there in order to not miss anything. As an aside, your shot of Portobella Road reminds me of a street scene in Calcutta. All that's missing is the tangled masses of rotting electric wires hanging over all. (And,of course, the fact that Indians would not be bundled up in heavy clothing) I really love your site. Thanks for sharing it all. FX's answer→ Carolina thank you for visiting! From my recollection of Calcutta, you might add no macadam and a rotting mule carcass that made quite an impression on me! But lovely people the Bengalis, no question. Can I just say that your metaphor of Portobello Road as a sewage drain of tourists to keep them away from notting hill area as whole is very apt. Inspired almost. I work for the local council there and portobello road is my area. I will visit that bookshops next time i am there. Many thanks for opening my eyes to the function of that area. FX's answer→ Harry, thanks for visiting and agreeing with my caustic portrayal of this market. I think London is a very smartly run city in that you guys find ways to direct the hordes of barbaric tourists who visit in a few selected areas. Everybody is free to roam about but most of that crowd goes to only a handful of places, keeping the rest of the city blissfully free! Books for Cooks is an amazing shop, so many great books, a nice comfy sofa and such helpful staff, but across the road the Spice shop absolutely rocks! if you can't find the spice (and heavens knows what else besides) you're after there, you won't find it anywhere. Run by a lovely lady. Never seen so many different varieties of dried chillies and they sell many of their products online. 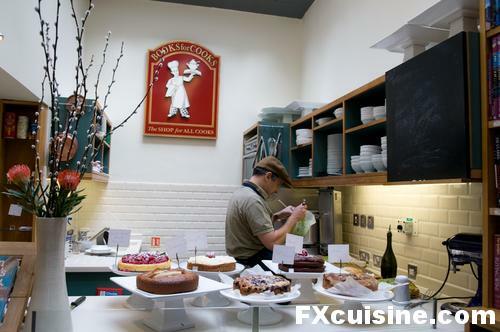 FX's answer→ James I will visit it next time for sure! Here in Switzerland we get our spices from http://www.poivre.ch/magasin/index.php, they have a really astonishing selection. Some things I need to buy abroad like pure vanillin crystals. about 200 more articles of yours to read!!! I have been ejoying your articles, as well as your recepies lately, thank you!!! 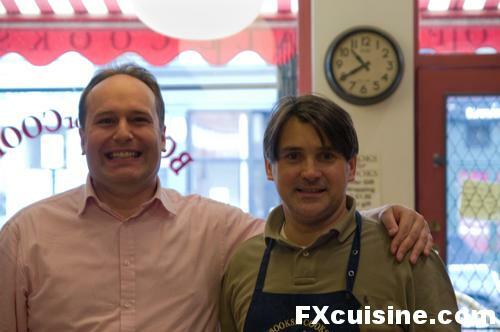 I will visit the store on my next visit to London.. leaving my friends on Portobello st.
FX's answer→ Thanks Vasilis, glad you enjoyed the piece and more is to come soon! Yes, certainly you must write this cookbook or face the Wrath of the Blog Readers. Not sure that a Swiss theme would be much of an enticement here in America; you'd need to explain first that, no, Switzerland is not part of Germany, and no, it's not Sweden (I only say that because I have had do this! ), and the only books about your country to be found here are generic travel guides. I just got a baker's guide to European pastry with an entire chapter on Switzerland, though, so Swiss cuisine isn't entirely unheard of over here. You might do well to take advantage of the grim economic zeitgeist and present a witty, pictorial guide to budget luxury cooking, with extraordinary results from simple but high-quality ingredients (more or less what you're doing already). I read somewhere recently that although books generally are selling very badly now, cookbooks are still doing well. That store sure looks like fun! And as for dieting, the only advice worth paying any attention to comes from Mark Twain: "eat what you like and let the food fight it out inside." 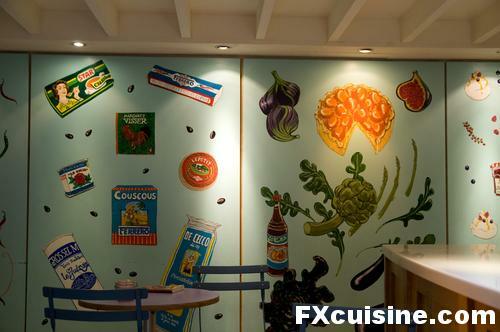 FX's answer→ So, FX's Cucina Povera? FX's answer→ Louise thanks for visiting! What a labor of love your bookshop must have been, we used to have one here in Switzerland but the owner had to retire because of ailing health. He had me in his home to buy from the stock that remained him though. I like your piece about potato chips, a discipline where the Americans rule! I wonder if the web will overtake books. As we know it is so easy to look up a recipe online. After all this is how I discovered you- happy day! as always many thanks for your artful commentary. FX's answer→ Yes, but not all websites are as good as a good cookbook! To a book lover as I, this is a step to heaven. Thanks!!! FX's answer→ They are really pretty! 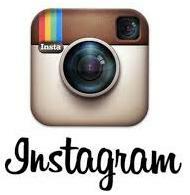 Wonderful to see you back in the groove of still photo posts!! Please will you be share your other 19 favourite bookstores in the world with us if only in a list? 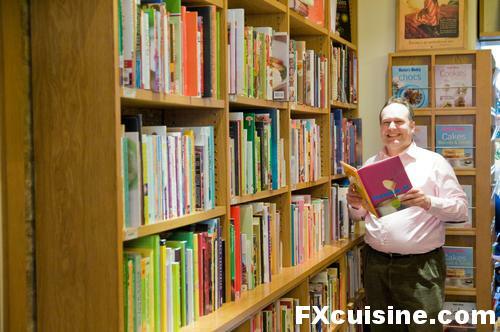 FX's answer→ Well, I don't read only cookbooks - most of these other bookstores are non food! You look so happy among the books. Thanks for sharing! FX's answer→ You should see me strolling through the alleys of gourmet shops then! I can't believe you've been to this shop, and not only once and you never checked out The Spice Shop accross the street (that said, I've been to the spice shop quite a few times but I've never been to the bookshop. But this is because it was closed.) Now, what the Spice shop has, is simply excellent spice from all over the world. They buy it from farmers in Asia and Africa and I don't know from where else and they are really good. They have everything you can possibly want. And they carry an impressive assortment of chillies. And curries. And you name it. 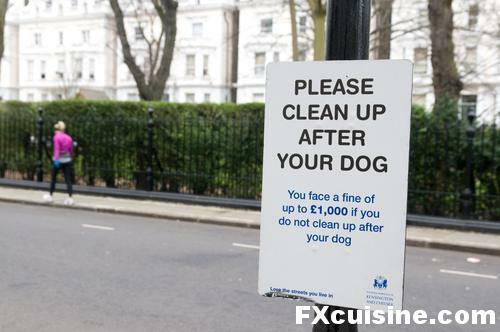 You owe it to yourself to pay them a visit next time you are in london. And if you do, ask for Birgit and tell her that the guy from Romania who wanted to open a Spice Shop in Bucharest says hi. FX's answer→ Dan I think I have passed it many times but never bothered to enter. The reason is I am very particular about my chilis and get them from Mexico, and have never found really serious chilis here in Europe. I find spices shops gimmicky and geared towards people who buy curry powders thinking this is good cooking, hoping that a magic powder will bring up their cookery, and am always rather disappointed. But no worry, I will visit this one shop next time and mention you - I will be glad to be proved wrong in my prejudice! Sorry to bother you again, but would the author count himself as a 'litterate tourist'? The English tend to spell literate with one t if they are. Another fascinating post, well done! FX's answer→ Anonymous English Elf, we must speak by the card, lest equivocation will undo us. How about sending me by email a list of the typos needing correction instead of pooping all over my blog? Actually, I thought you were indulging in some clever wordplay here with the word "litterate," as you were writing about an anti-littering sign! And, "illiterate" is spelled perfectly; it would be very odd to misspell one word and not the other. I love these bits of wit scattered within your articles and I am sure you have plenty of linguistic fun planned for us on video as well! Unfortunately, however, Google advertising detected the wording of the last answer, and a huge, ugly ad for Phillips' Colon Health probiotic laxative has been posted into your article, twice! I just about died laughing! I wish Google could be more literate! FX's answer→ Yes, those google ads really add a little spice, don't they! I can get lost in a place like this, indeed. Thanks for the discovery! It has been set in my agenda for my next visit to London. Hope my wife will forgive me! I'll let you know. 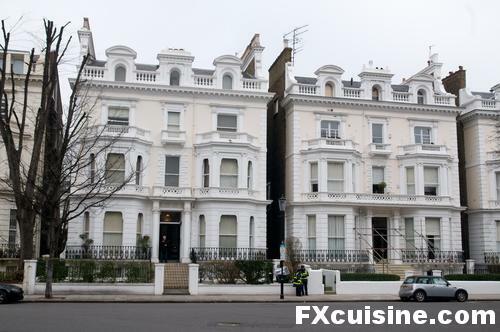 FX's answer→ You will love this place! FX's answer→ Yes it is always a nice place to visit! One of the most exciting things to do when I will visit London again!!!! Me and my hubby we are big food lovers/cooks and we collect cooking books from every place we visit.. wish I knew about this shop when we 've been in London!